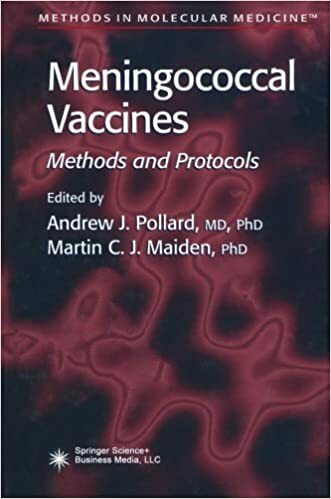 By Henry N. Wagner Jr.
Because the first popularity of outbreaks of cerebrospinal or noticed fever on the finish of the 19th and the start of the 20th centuries, the threat of the meningococcus has been excessive at the checklist of public healthiness prio- ties. Few if any pathogens surpass the meningococcus within the rapidity and sev- ity with which it devastates formerly fit participants. This is often the 1st ever textual content at the intrinsic self-assembling behaviour of peptides and the consequences of those homes for a huge variety of functions. those comprise protein conformational illnesses, the engineering of nanostructured biodegradable and biocompatible polymeric fabrics with capability functions in tissue engineering, biomedical units, commercial fluids and private care items. When I told him my only difﬁculty was scheduling, he responded: “No problem. ” When I returned the next morning, the exam was nowhere to be found, but fortunately, Dr. Whitehorn arrived at his ofﬁce, and helped me search his desk for the exam which he had left. We never found it, but again, he said: “No problem. ” I passed the exam. Research was greatly encouraged at Hopkins, and the faculty was always willing to encourage students to participate. An episode that illustrates this point occurred during an oral examination that I was being given in the library by the Chairman of the Obstetrics and Gynecology Department. His most striking characteristic was his curiosity. He constantly asked questions, a habit persisting throughout his life. He never took a superior attitude in his relationships with colleagues, students, or technologists. We worked together carrying out experiments on rats, monkeys, and human beings. We developed instruments to measure motor activity in rats, the galvanic skin response in monkeys, and instruments to map the patterns of sweat gland activity in patients with a variety of diseases, including a congenital absence of sweat glands. I inherited his red hair, but not his lack of interest in travel. My grandmother was a German-American, who met my grandfather after they arrived separately at the immigration pier at Locust Point in Baltimore, among hundreds of thousands of Irish and German Immigrants in the 19th Century. Baltimore was second only to New York as the point of entry of immigrants coming from Europe at that time. After two years of high school, my mother went to work as a secretary at the Pennsylvania Railroad. After her marriage to my father, a salesman of wholesale woolens from England, she moved to west Baltimore to live with my father and his mother in a six room row house with white marble steps, a hallmark of Baltimore.